Alas, Sir Rhubarb. She knew him well. Sir Rhubarb, previously "Mr. Roo," was among the chickens in the urban garden of Bea Lackaff. She lives on Bridge Avenue, the dividing line between swanky Kendall Yards and the low-income West Central. You see, Lackaff used to have a problem with her chickens being massacred. "Skunks or raccoons or neighbors dogs would get in," Lackaff says. So for the past 20 years, she had the occasional rooster, partly as first-line of defense against an attack. Roosters are more aggressive, more willing to put up a fight to protect the hens against an invading army of chicken-killers. "It’s the natural order of the flock to have a rooster," Lackaf says. "There’s a social balance there. They’re a good defense — even if they’re not strong enough to fend off a predator, they will sound an alarm." But back in 2014, the city passed new urban farming rules. "We increased the number of chickens but got rid of roosters," City Council President Ben Stuckart says. "Because they’re loud." And yes, dogs can be loud, too. But not all dogs bark loudly. Roosters are predictably loud. Citizens told the council they didn't want roosters waking them up every morning. 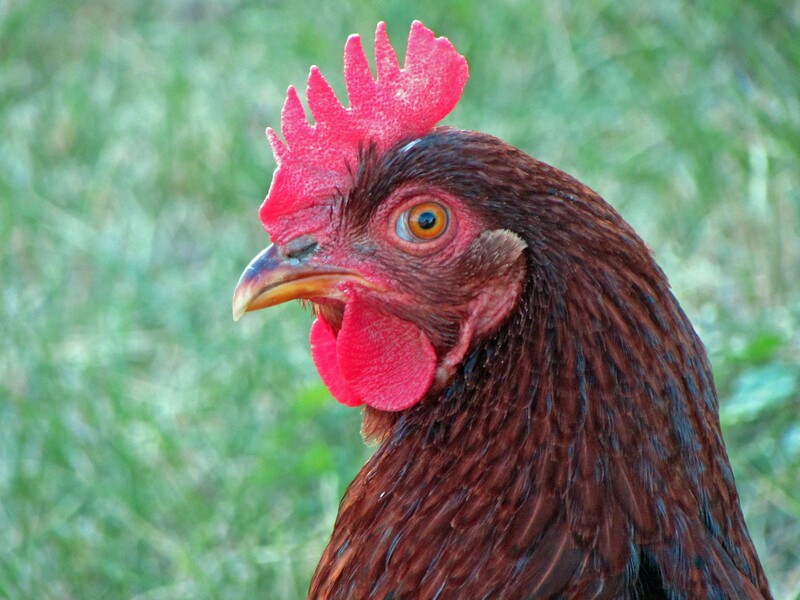 Not only that, but other cities banned roosters from urban farming. Existing roosters would be grandfathered in. Lackaff doesn't remember whether she had Sir Rhubarb back in 2014. But she hoped that, because the Banty roosters were a bit quieter, nobody would complain. "I didn’t think many of my neighbors minded," Lackaff says. But at the beginning of January, while she was on a trip to Portland, her house-sitter called to let her know that she'd have to get rid of Sir Rhubarb — someone had complained to code enforcement. "I’m a little bit dismayed that whoever it was wouldn’t tell me," Lackaff says. It took her a while to find a couple willing to take him — the code enforcement officer was stern, but patient — but finally she found a couple in western Spokane County who was willing to take her rooster. She says she understands the necessity of her sacrifice. "It makes sense, considering the close-packed nature of people’s communities," Lackaff says "Not having a rooster is the price I have to pay for the privilege of having chickens in the city." Nevertheless, Lackaff contacted the Inlander wanting to share the essay she wrote about losing her rooster. We obliged. “What’s it ALL for?” he cried, breaking the still of night as I wrestled a wire cage out of the garage. On the other side of the wall sat my little philosopher king, perched on his roost, sandwiched between the fluffy bosoms of his three wives. He was silent for another dark hour until, as the shapes of trees and buildings slowly emerged, he squawked in indignation, and demanded – “What’s it ALL for?” This cycle of meditation, and outburst repeated, as it has in chicken yards for millennia, since that other dawn - that of Agriculture, some 8,000 years ago. Back then the Spokane Tribe proudly hosted well run inter-tribal gatherings for harvesting and drying salmon, enjoying family and community, a short distance away down in People’s Park near the confluence of Hangman Creek and the Spokane River. Roosters have been crowing in West Central for at least 130 years, as families helped make ends meet by supplementing hard-earned wages with gardens, orchards, keeping chickens and goats, and fishing the nearby river. But, let us whiplash back to the present and the imprisoned shining red rooster. Indeed, it is his eternal question, torn from his soul and flung out to the universe at random hours of the day and night, that has caused an anonymous neighbor to call City Code Enforcement and report his illegal status. For harboring this disturbing bird, I am subject to fines up to $269 a DAY if I do not comply with the Urban Agriculture Zoning Ordinance by removing him from the property. While oft-reported drug sales continue a block away, and occasional scary unleashed dogs romp down my alley – it is my brave little rooster that is curtailed to establish the greater good for my immediate neighborhood. I have asked around, but neighbors claim to not even know there IS a rooster; or to say they kind of like it – maybe it reminds them of visiting their grandparents as children. No one fesses up. I just want to know why they didn’t talk to me. Waiting for the day to warm and soften the slippery surface of icy roads to my friends’ awaiting chicken yard (zoned rural-agricultural), I hear on the radio an interview with a man living with his wife and baby daughter in a besieged village in Syria. He says he hopes to live in peace and to keep his family alive. Every day is a heavy burden. When his town is only bombed once or twice a day.….it is Paradise! Be still little rooster – we are so lucky to live in a still functional city that struggles, for better or worse, to fairly protect and provide basic services for its citizens. The world keeps changing and we are swept along with it. My Tudor rooster is now once again in favor – dubbed Sir Rhubarb, he has freedom within spacious, luxurious quarters; and benignly reins over his ten fat wives. Here in West Central, while some neighbors must appreciate their new peace and quiet, some of us still have a hollow feeling when we miss the crow of, perhaps, the Last Rooster in West Central. Well, Sir Rhubarb, my best guess is that before it is too late, it is about how the people learn to live peacefully together. Ospreys and marmots and turkeys, oh my! Bridge Avenue stands as the dividing line between the swanky Kendall Yards and impoverished West Central. Is that about to change?